The San Giorgio in Velabro. 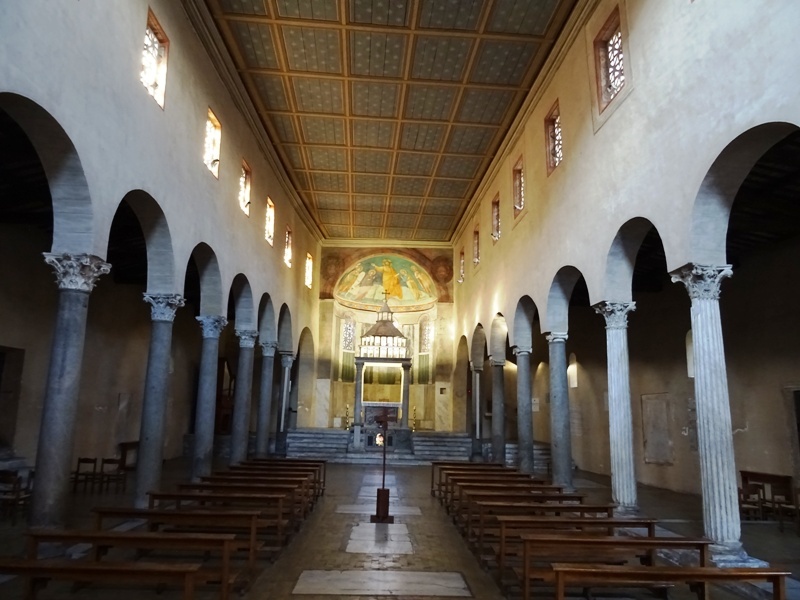 It is difficult to explain why a tourist in Rome should visit the San Giorgio in Velabro. There is not much of interest to see. The architecture is clumsy, there are no artistic treasures inside and the only thing that can be considered ‘art’ – the apse fresco – is actually of mediocre quality. The church is probably most famous for having been the victim of a terrorist attack in 1993, when a bomb planted by the Mafia severely damaged the facade. And yet, I still vividly remember visiting the church in November 2013, some 20 years after the Mafia attack. My friend and I had the church to ourselves. We had not even planned to see the San Giorgio, but when we passed the church on our way to the Forum Romanum, we simply had to go inside. There was no guard, no caretaker or verger to be seen. The light was nice, the atmosphere serene. The church’s soberness and simplicity – although modern rather than medieval, see below – was quite charming. Even though we had certainly seen much better apse frescoes, the one in the San Giorgio was still interesting enough to admire it for a minute or two. To sum up: the church does not have the looks, but it does have the feel. The foundation of the San Giorgio is usually attributed to Pope Leo II, who was pope for less than a year between 682 and 683. San Giorgio is of course better known as Saint George in the English-speaking world. He was a Roman soldier who was martyred during the reign of the emperor Diocletianus (early fourth century). The legend about Saint George the dragon slayer needs no further introduction. Saint George’s cross is now part of the English flag. It is not clear whether the church has been dedicated to this saint from the start. There is a possibility that it was initially dedicated to Saint Sebastian and that Saint George was only added when his relics were transferred to the church during the pontificate of Pope Zacharias (741-752). Saint George is by all means an ‘Eastern’ saint: he grew up and died there, the slaying of the dragon is set in Berytus (modern-day Beirut), his name is Greek (Georgios) and his cult has always been immensely popular in Eastern Orthodox countries. Yet since this part of Rome had a large Greek community in the eighth century, Rome was part of the Eastern Roman Empire back then and the popes were loyal subjects of the emperor in Constantinople and his representative in Ravenna, it is not altogether illogical to find an early medieval church dedicated to Saint George in the West. The ‘Velabro’ part refers to the Velabrum. The origins of the name are obscure, but the Velabrum was a swamp between the Aventine to the south and the Palatine and Capitol to the north (see Rome: Santa Maria in Cosmedin for a map). 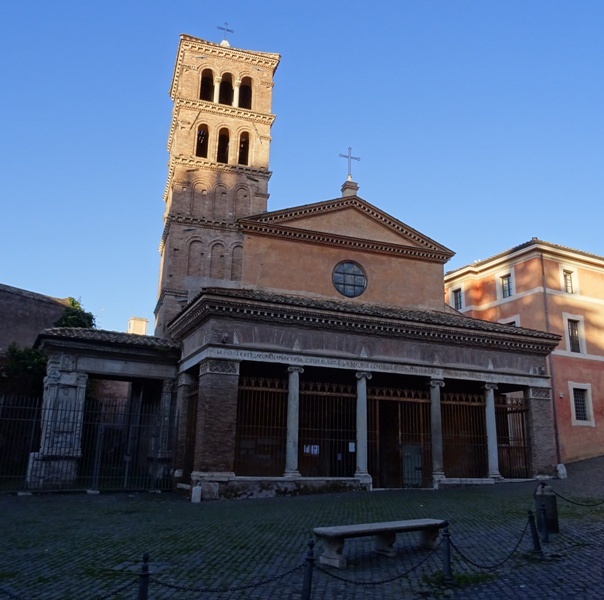 The church is near Rome’s ancient vegetable market (Forum Holitorium) and cattle market (Forum Boarium). In fact, the Arcus Argentariorum – Arco degli Argentari in Italian – which is partly incorporated into the western wall of the San Giorgio, was probably an ornate gate giving access to the latter forum. The gate is much older than the church. It was constructed in 204 by money-lenders in honour of the emperor Septimius Severus and his family. The interior decorations of the gate showed the emperor, his wife Julia Domna, his sons Caracalla and Geta and perhaps Caracalla’s wife Fulvia Plautilla and his father-in-law Plautianus as well. Caracalla had the images of Geta (and those of his wife and his father-in-law if they were depicted too) removed after murdering his brother in 211. The arch can be seen to the left of the church (see the image above and on the right). Apse fresco by Cavallini or his school. 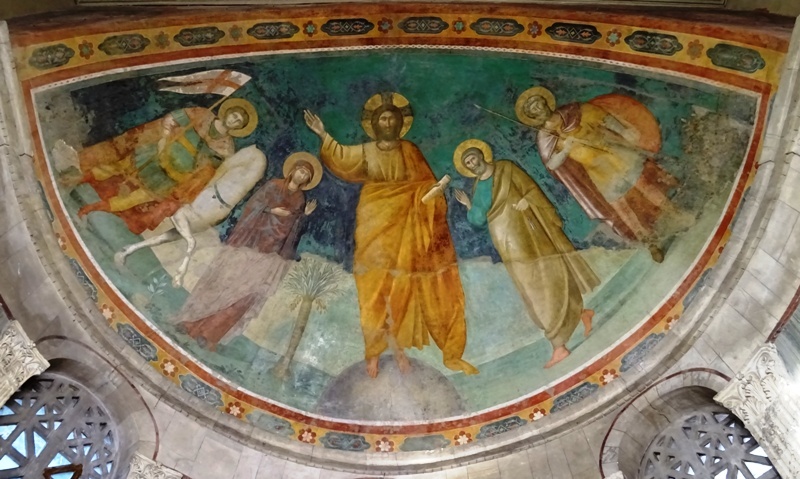 The apse fresco has long been attributed to the famous Florentine painter and architect Giotto (1266-1337), but it is now thought that the fresco was made by his contemporary Pietro Cavallini (1259-1330) or someone from his school. However, it is certainly not of the same quality as Cavallini’s fresco in the Santa Cecilia in Trastevere or his mosaics in the Santa Maria in Trastevere. In the centre of the fresco is Jesus Christ. On the right are Saint Peter and Saint Sebastian, who was also a soldier in the Roman army and is dressed as such. On the left are the Virgin Mary and Saint George. The latter is riding a splendid white horse and is carrying his battle standard with the familiar red cross. A part of the battle standard is among the church’s relics, as are Saint George’s skull and part of his spear. San Giorgio in Velabro on Churches of Rome Wiki. Update 11 January 2017: pictures have been updated.